Wow. It wasn't until I actually put this little picture collage together, that I realized how much this little room has been through in 3 years. LOL. But I wanted to share what we have finished so far! But I was thinking... "I'll be painting this soon" the DAY we put the color up. lol. Probably more to appease my hubby, I left it as long as I did. I have fallen in LOVE with this Autumn Haze from Glidden, that's mostly all over in the rest of the house, and it matched well with the twins' cream in their quilts... I had a bunch left over... so I went with it... and am REALLY liking it against the white trim. I have been eying THESE bunk beds forEVER, but knew i could NEVER afford them... so I did a TON of research... and thanks to the KSL adds, we found this lovely set of bunkbeds for a 1/4 of the cost! AND we added the drawers, for extra storage! When we finally decide to move the girls downstairs, as they get older, these beds come apart. So that will be nice! I had this fun dress form that was it's original brown iron color, so I took some pink spray paint to it... and wa-la! Cason's Mom bought me this cute $7.00 frame at a consignment shop, a few weeks back. We bought some fun new knobs from Anthropology they have some of the funkiest, neatest hardware there. LOVE that place! I plan on hanging a long mirror here, with a cute pink hook. This is just a picture of the trim we did. We bought these precut boards from HD for about... $2.00 a piece, put them up with some liquid nails, and then added the piece of trim on top! SO EASY! And I love them, because it takes up wall space, without having to actually HANG something on the wall. Well, there you have it! I love this room because it has TONS of natural light pouring in every morning. It's so refreshing. And I'm pretty sure it will stay like this for a while...! I love love love their room. Such a sweet little girls space. So girly and so darn cute. You should enter it into a magazine! I agree w/ the other comment you should enter it in a magazine! That is so pretty! I love the surprise pops of blue. Great Job. Where on earth did you find those precious quilts in the twins room? I love love love them! 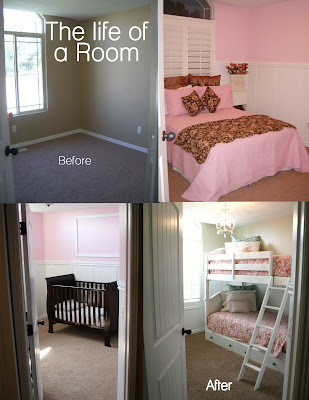 Adorable little girls room! I love the idea of the drawers under the bed, might have to borrow that for my son's room. I have had Glidden's Autumn Haze in my dining room for the last 10 years. Love it! I have yet to grow tired of it. Good choice. i just found your blog. i love your style, your home is beautiful. if you don't mind me asking... where did you find those quilts? Such a pretty little girls room! I love that you've kept it the colors and simple. Just found your blog and I adore this room! I have twin girls, too, and you've inspired me to start thinking about their "big girl" room. Looking forward to exploring more posts now! I'd love to know where you found the quilts in your twins room. They are just what I am looking for my youngest bedroom. Thanks! Just bought the same light for my daughters room...brought it home and realized it was going to hang way too low also!!! So I brought it to my handy neighbors house for brainstorming with her hubby, and this is the EXACT idea that we came up with. Now I'm looking for the ceiling plate. Where did you find yours?